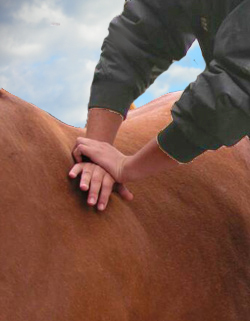 For your convenience All Points Equine offers the Chiropractic care for our clients in the field. Chiropractic care focuses on abnormal movements of the spine and the effects these restrictions have on the nervous system and the entire body. The goal is to optimize mobility and nervous system function to allow the body and the brain to communicate effectively. Veterinary Chiropractic care is a manual therapy, which can be used for many health and performance problems. Chiropractic treatment does not replace traditional veterinary medicine; however, it can provide additional means of diagnosis and treatment options for spinal problems as well as biomechanical related musculoskeletal disorders. It can often eliminate the source of acute or chronic pain syndromes. Veterinary chiropractic treats verterbral subluxation complexes which is the functional misalignment of a vertebra or the limited mobility of its facet joints. Reduced mobility between two vertebrae can affect the nerves that leave the spinal cord between these adjacent vertebra. Alteration in the nerve’s function can lead to interference in the flow of information, which is necessary for smooth coordination of body functions and muscle contractions. Changes in neurologic function can result in a lack of coordination that may cause injury to other joints and tendons or ligaments in the legs. An animal with a subluxation will change its posture to compensate for the restricted mobility of its spine and to avoid pain. Chiropractic care is a very specific and gentle treatment that uses the doctors hands and fingers to correct vertebral subluxation complexes. It works within the normal limits of the joint and it’s supporting structures. Treatment helps restore mobility and optimal neurologic function. Please contact us for further information or to set up an appointment.